I know that we have learned that you can’t take anything to heaven when you die. So, all the “stuff” we accumulate while on this earth means nothing. I learned this first hand recently when my mom passed away and went on to heaven… she left EVERYTHING behind and I mean EVERYTHING! We have sifted through pictures, papers, old cards, receipts, books, clothes, jewelry boxes, Christmas decorations, platters, jars, shoes (I now know where I got my shoe addiction! ), drawers and boxes of “treasures” (the coupon book I made her in 5th grade was sitting in the top drawer of her desk) and notes written on anything that would sit still! My mom was a writer and she documented everything! That is a huge gift for me, as I hope to write a book about her life. Back to my favorite things. If you asked me about my favorite possession, I would have say it is my Willow Tree Nativity. I have collected the Willow Tree Angels for some years now and a while back, splurged on the nativity. I have such fond memories of our nativity set growing up – baby Jesus hanging out behind the stables until Christmas Eve and the Angel Gabrielle hanging from the fire place flue (that thing that opens and closes the damper). Oh, by the way, the nativity sat in the very clean fireplace. I have always had little nativity sets – nothing fancy. 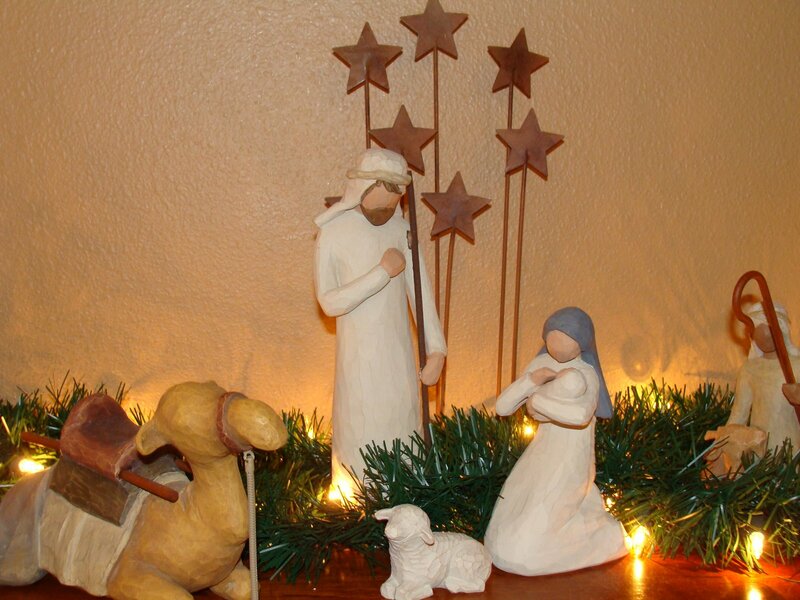 It is something that just brings peace to my heart and sums up why we do this thing called “Christmas.” I loved the Willow Tree set so much that I finally “got me one!” Now, as the dishes are done and the turkey leftovers are being put away, out comes the nativity! I want to have it up as long as possible! I have actually thought about keeping it up all year, but I know that it might eventually lose it’s luster and meaning. Out come the boxes and each figurine is carefully taken out of its original styrofoam case. Each piece is gently placed on the special table and admired. Then the story begins to play out. I think about the journey of Mary – a young woman; pregnant, uncomfortable, scared, tired, yet joyous at the prospect of giving birth to the Christ Child. Then there is Joseph – a young carpenter, weighing his options and divinely choosing to stay by Mary’s side and be an earthly father to Jesus. The Wisemen that came a very long distance, following the Star of David; finding at the end, a miracle. There are some minor rolls played by the stable animals. They were extra’s, but I am sure a comfort to Mary and Joseph in their hours of pain and anticipation. I am certain there was a little drummer boy who came and played his drum for them – pa rum pa pum pum. As a child I loved the Little Drummer Boy and to this day it is one of my favorite Christmas songs. Next there was the Inn Keeper who so graciously offered the stable when there were no more rooms. Isn’t that just what Jesus would have done? Last, but certainly not least, hiding behind the stable until Christmas Eve, we have Jesus – the leading roll, the star of the show – the savior. At this moment, I feel at a loss for words to describe Him – gentle, a baby, glorious, Wonderful Counselor, King of the World, Mary’s son… Growing up I thought Jesus was a bible character – a very important one! As I grew older I came to know Him in a very personal way and realized that He is more than just a character in a great story. He is the Son of God, the King of Kings, the Way, the Truth and the Light… my eternity. Girlfriend, you have touched my heart once again! I look at that nativity set each time I go into Christian Supply and think about each piece, too! It is such an amazing set. One day…or as I think of things these days…”How many days of guest teaching to pay for it?” :)I will be at your school on Tuesday…can’t wait to give you a big hug!